Berlin is a city that is constantly evolving, and the culinary scene is a direct reflection of that change. Chef Tim Raue is the epitome of the culinary evolution, whose culinary style is cutting-edge contemporary. GaultMillau awarded him the highly prestigious title of Chef of the Year 2007, making him at age 32, the youngest chef to ever receive this award. He is quite proud of this award and rightly so, and feels that with this award that GaultMillau is looking to the next generation, and looking forward. Chef Raue is no stranger when it comes to awards; his many awards include Chef of the Year Berlin 2000; GaultMillau 2005 Chef of the Year - Shooting Star; and Chef of the Year Berlin 2005. He began his career 10 years ago after completing classical German training consisting of 3 years of school and work, and graduated with a degree as a cook. He spent most of his time working in Michelin-star restaurants, where he was often considered an "enfant terrible," who does not like Mediterranean and Italian cooking, and is not a fan of olive oil. Having grown up in Berlin in an area with many Asian foreigners, he learned the three key elements of his cuisine focus: sweet, sour, and hot, and feels that with this philosophy you will never be bored. Since April 2003, he has been the Executive Chef at Restaurant 44 where he rebuilt the restaurant concept. His attitude is that people are hungry for emotions, hungry for fun, and his clients have stood beside him in his choice not to follow the crowd. He believes that "chefs must go their own way, and not copy other chefs. However, to go your own way, you must be a very strong chef. I am Tim Raue and I do what I want to do. I like to share my knowledge with my staff, teach them and promote them." I had dinner at Restaurant 44 in March 2007, and experienced his unique approach of the three elements, and I must agree that my mouth was never bored, and his presentations were an artistic delight. Pan-fry the filets on both sides in citron oil. 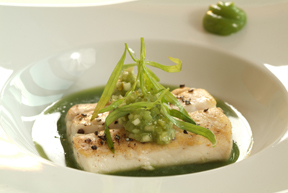 Season the halibut with salt and freshly ground black pepper, and bake in the oven at 80° C (175° F) for 10 minutes. Put all ingredients in a pot and boil for two hours. Strain the fluid in the pot and boil again. Stir in the agar agar powder, and cook for 10-15 minutes. Mix all ingredients except tarragon leaves and marinate with the citron oil and a dash of the Thai chili sauce. Boil the cream, pour over the chocolate and occasionally stir until the chocolate melts. Add chili powder and pimento to taste. Pour on square plates and let cool. Mix all items together and freeze in a long shallow tray. Cut raspberries into half, marinate with the coulis, and garnish with the julienne melissa (mint). Cut the banana in paper-thin slices; mix the Vitamin C powder and the garam massala and mix in the syrup. Place the banana slices on a silpat mat and thinly brush with the syrup mixture. Dry in a 100° C (200° F) oven for approximately 1.5 - 2 hours. Read about 44 in the Restaurants section.